BASSETERRE, ST. KITTS, August 13, 2017 (PLP PR Media Inc.) — Constituency Number Three branch of the Peoples Labour Party (PLP) held a successful fundraiser breakfast on Saturday August 12 aimed at fostering more community spirit. 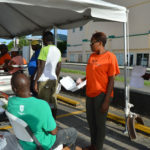 Branch Chairperson Senator the Hon Akilah Byron-Nisbett, who is also the National Deputy Political Leader of the Peoples Labour Party, said that funds raised at the breakfast and those to be raised in other future fundraisers will be used in the lengths and breath of Constituency Number Three to assist those who need a helping hand. “Our community initiatives would involve helping persons with simple things as being able to provide wheelchair access in homes where there is none, or even helping someone to build a bathroom in their home,” observed Hon Byron-Nisbett. 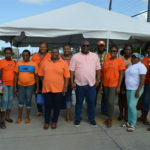 The fundraiser breakfast which was held at parking lot opposite Best Buy Supermarket in Camps, was attended by the Peoples Labour Party’s Political Leader and Federation’s Prime Minister Dr the Hon Timothy Harris, and other members of the PLP National Executive. Also giving support were members of the PLP Branch #7 Women Empowerment Group. “We are thankful that the Prime Minister came and his presence was here and felt. We are thankful for the support he continues to render to Constituency Number Three as we work together to build a strong Peoples Labour Party and therefore a strong Team Unity,” said the PLP Number Three Branch Chairperson. Coming in to lend support included the PLP National Secretary Ms Myrtilla Williams, National Deputy Chairman Mr Craig Tuckett, Deputy National Secretary Mr Christophe Greaux, Party Organiser Mr Alexis Nisbett, Women’s Arm Representative Mrs Sonia Henry, and Youth Arm Representative Mr Manasses Huggins. From the PLP branches came Chairmen Mr Cante Bowry (#1), Mr Lenworth Harris (#7), and Mr Wendell Wattley (#8). Also giving support were the Permanent Secretary in the Prime Minister’s Office Mr Osbert DeSuza, and Ambassador His Excellency Michael Powell. All the Constituency Number Three Branch Executive members, including National Executive Youth Arm Representative Mr Damian Weekes, had turned up and had been busy before 6:00 am when the breakfast was scheduled to start. The turnout was very good as all the printed breakfast tickets sold out, while there were a great number of persons who walked in to get a share of the breakfast. 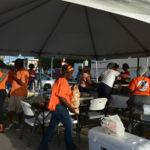 Buoyed by the success of the fundraiser breakfast, Hon Byron-Nisbett said that they were hopeful that along with the other fundraisers, that they will be able to do a number of the community initiatives planned for the community. “We are thankful for all the persons who contributed in any way to the breakfast, persons who would have provided meals, or provided us with the ingredients that we needed,” concluded Senator the Hon Akilah Byron-Nisbett.